At Gate of Heaven, we know that most people must make burial arrangements during very difficult times—times of grief, sadness and loss. Our staff will treat you with dignity and help you deal as comfortably as possible with the decisions you need to make. We are here to carry out the sacred religious function of burial and to care for the resting places of deceased members of the Church. Gate of Heaven Cemetery offers a wide range of burial options to meet your family’s needs in carrying out the sacred burial rights in accordance to church teaching by providing a permanent resting place for your loved one. A traditional burial provides families with the beauty and simplicity of a permanent place to visit. An above-ground burial option for families within a building-like structure. 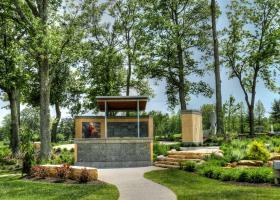 A 7 acre development of pre-installed, two-tiered burial vaults surrounds our bell tower and fountains. The sounds of soft bells, fountains, or trickling waterfalls provide a serene setting for the proper disposition of cremated remains. Niches are available in a climate-controlled columbarium, providing after-hours access and comfortable surroundings for family and friends to visit, pray and reflect. 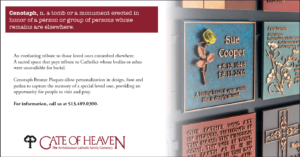 Celebrate your loved ones lives and memories through a bronze memorial footstone, a granite bench, cenotaph plaque or a memorial tree so that they may live on forever. 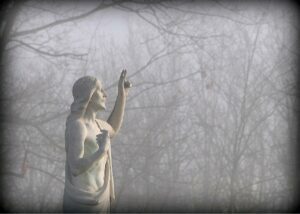 Gate of Heaven Cemetery offers a location tool to provide genealogical assistance as well as help for families of persons interred at the cemetery. We update our records regularly, but if you cannot find someone you are looking for, please contact us. Stay up to date with what's happening at Gate of Heaven. Click here to check out our News Archive. The Gate of Heaven staff is always willing and able to meet with you personally to discuss your options and to answer any questions you may have. If you would like to consult with a Cemetery Sales Advisor, let us know that you would like to schedule an appointment now.